On 14 February 2018, WHO/Europe’s programme on migration and health will host the fourth in a series of webinars dedicated to addressing refugee and migrant health and well-being. 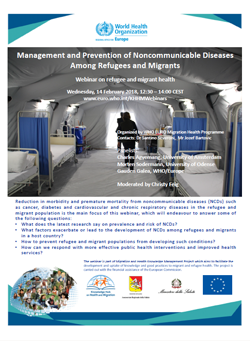 The webinar will discuss the management and prevention of noncommunicable diseases (NCDs) among refugees and migrants. With increasing population movement to Europe and the changing burden of disease globally, the prevalence of NCDs among migrants and refugees presents a critical public health challenge for the WHO European Region. The webinar will focus on approaches to reducing morbidity and premature mortality from NCDs such as cancer, diabetes, and cardiovascular and chronic respiratory diseases among migrant populations. It will endeavour to answer some of the following questions. What does the latest research say on prevalence and risk of NCDs? What factors exacerbate or lead to the development of NCDs among refugees and migrants in a host country? How can we prevent refugee and migrant populations from developing such conditions? How can we respond with more effective public health interventions and improved health services? The webinar will be moderated by former WHO Head of Communications Christy Feig. Free lunch will be provided for in-house participants. The webinar will also be available on the Knowledge Hub on Health and Migration website following the event. The webinar is presented as part of WHO/Europe’s programme on migration and health and the Knowledge Hub on Health and Migration initiative. The Knowledge Hub was launched in November 2016 in response to the need for a single institute devoted to migration and public health in the Region. It provides a forum for sharing scientific knowledge, building capacity and informing policy-making in this context. The webinar series is one of 5 key elements of the Knowledge Hub, alongside an annual summer school, policy dialogues, a knowledge library and high-level summits. It is a collaborative effort under the Migration and Health Knowledge Management (MiHKMa) project, funded by the European Commission.